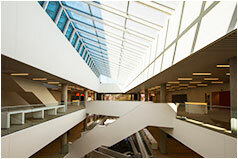 Before doors opened, the Library used photos and video to offer sneak peeks of the Central Library’s interior spaces. 360 panoramas allowed curious onlookers to follow the building’s progress, from construction to completion. When opening day arrived, we captured the joy felt in experiencing My Library.